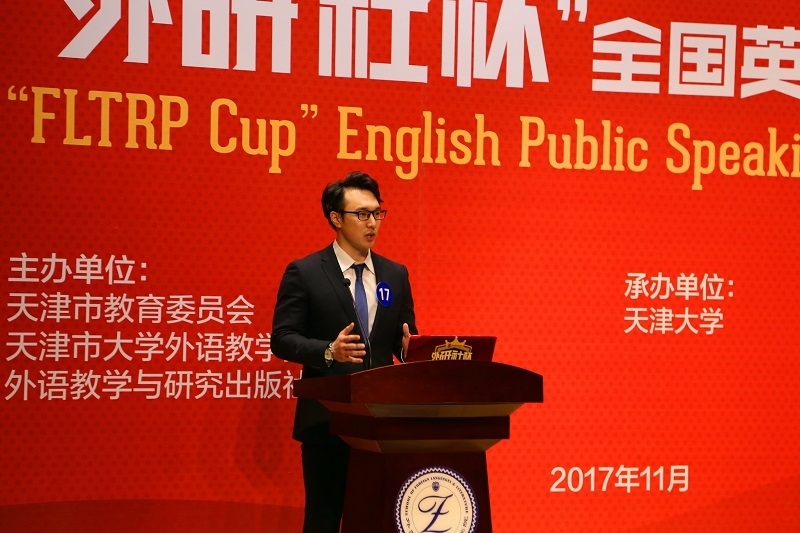 On November 12th 2017, the 20th English Public Speaking Contest for college students of Tianjin municipality and 2017 “FLTRP Cup” English Public Speaking Contest (Tianjin Division) was held in the lecture hall of Tianjin University Library on the new campus. 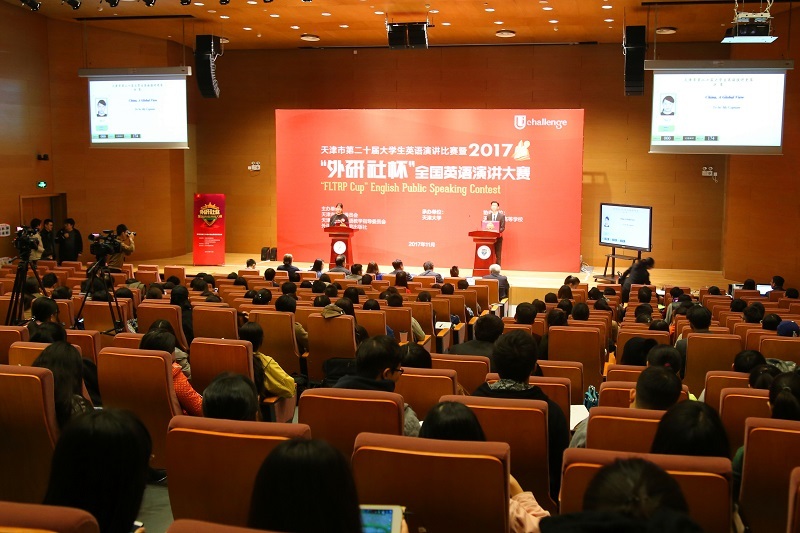 This contest was co-held by Tianjin Municipal Commission of Education, the Adversary Committee of College Foreign Language Teaching of Tianjin and Foreign Language Teaching and Research Press, hosted by Tianjin University and supported by other universities and colleges in Tianjin. The guests present were: Bai Haili, Deputy Director of Tianjin Municipal Education Committee; Lian Zhongfeng, Director of the Higher Education Department of Tianjin Municipal Education Committee; Liu Bing, Deputy Director of the Higher Education Department of Tianjin Municipal Education Committee; and Sun Fenglan, the Vice Editor from Foreign Language Teaching and Research Press. 75 contestants from 30 universities in Tianjin participated in the Contest and 21 of them entered the final. The final consisted of four parts: prepared speech, Q&A session, impromptu speech and comprehensive quiz. The topic is “China, A Global View” for the part of prepared speech. All the contestants used different styles and expressed their own opinions about China’s world view and the world’s view of China from different perspectives. And in the part of impromptu speech, they demonstrated their capacities and language abilities to express their opinions clearly. 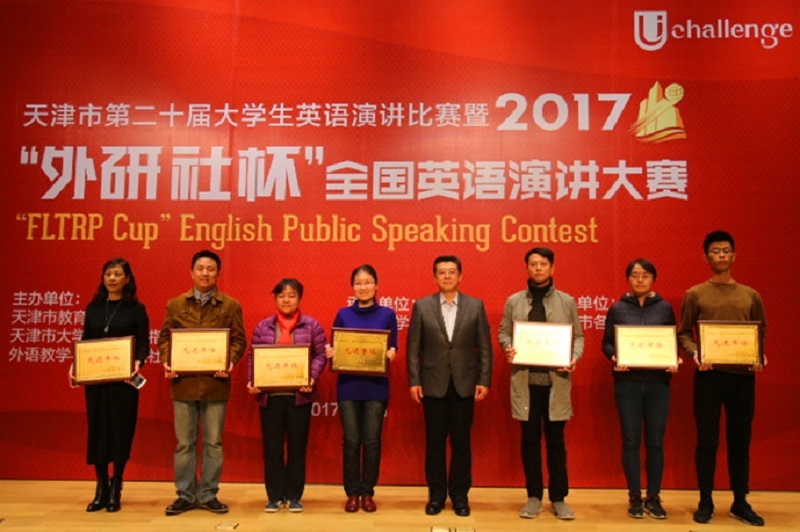 After a fierce rivalry, Liu Xuanyue from Tianjin Normal University, Zhou Luyang and Bi Jiayi from Nankai University won the Grand Prize and were qualified to participate in the 2017“FLTRP Cup” English Public Speaking Contest on behalf of Tianjin Municipality in Beijing. At the end of the Contest, Professor Ji Weiwu gave the contestants his comments on their performance, and shared his view on the future of English Public Speaking Contest. Then the organizer also issued certificates and prizes to the winners who won places in the "FLTRP Cup" English Reading and Writing Contests. At last Sun Fenglan delivered a closing speech. The Contest has come to a successful ending so far. The English Public Speaking Contest not only provided a platform for the contestants to show their foreign language skills, communicative abilities, critical thinking skills and improved the contestants’ comprehensive abilities of foreign language application, but also offered rich experience for foreign language teaching and has led the reform and development of foreign language teaching in colleges and universities.